Get Out – Blu-ray review | What Hi-Fi? Jordan Peele, formerly of US sketch comedy duo Key and Peele, has stretched his legs with his first directorial effort in horror/comedy Get Out. Peele has made a film that's a social commentary on race relations in America. It's confident in its execution and refreshingly intelligent in its take on the subject matter. A break-out success, having made $252m on $4.5m budget, it's a fun, funny and often spooky effort that's a contender for one of the year's better films. The plot follows Daniel Kaluuya's Chris Washington, who's about to meet his Caucasian girlfriend's parents for the first time. He's worried about how receptive they'll be to his being black, but Rose (Girls' Allison Williams) casually bats his concerns away. On the way to her parents' house, they hit a deer (the first in a number of unsettling moments for Chris), which is followed by a visit from a police officer that's laced with racial tension. Things only get stranger as Chris has to navigate a maze of awkward interactions, whether it's Rose's parents (Bradley Whitford and Katherine Keener), her brother (Caleb Landry Jones) or, well, everyone else. The few black people Chris sees (Marcus Henderson, Betty Gabriel, Lakeith Stanfield) exhibit very peculiar behaviour, leading him to think there is something amiss at the Armitage residence. Get Out is smarter than your average horror/thriller, exploring the everyday racism (casual or otherwise) a black person experiences, and the cultural appropriation of black identity. Peele's a talented comedian, but his control over tone, balancing comedy with the spookier elements of his script, is rather deft. Whether it's the sight of a man running full-pelt at the camera in the middle of the night, or the stirring of a teacup that's genuinely unsettling, Get Out is both funny and alarming (sometimes in the same moment). It's a sign of the film's impressive balancing act. Performances excel across the board. Kaluuya is nicely calibrated between paranoia and restraint, playing the awkwardness of the situation to a tee. Alison Williams is a charming presence, who's ignorant of the overt attention Chris is receiving. As Rose's parents, Whitford is the chummy, bracing liberal who's almost apologetic in tone ("I would have voted for Obama a third time If I could"), while Keener's Missy comes across as suspicious from the off, resulting in a mock therapy scene between her and Chris that's memorably uncomfortable. Caleb Landry Jones plays Rose's brother Jeremy and there's just enough of a sense of menace and potential for violence whenever he's on screen. Marcus Henderson and Betty Gabriel's performances as the gardener and maid are wonderfully strange, while Lil Rel Howery as Chris's friend Rod delivers several of the film's best lines. Get Out's Blu-ray release (the 4K has been pushed back to September) is a sharp and clean transfer. Shot digitally, it has an autumnal look that is particularly noticeable in the Armitage house interiors. Black skin-tones can often be tricky but they look extremely good here. Skin-tones in general appear natural. Colours are solid and stable throughout. A TV that's good with detail will be able to pick up many moments – whether it's facial detail (pores, beard, sweat) or the texture of clothes. All of it is excellent, and detail holds up well in low-light scenes. Day scenes provide a nice and bright image, but blacks aren't overlooked, with a deep performance throughout. The 5.1 DTS MA track is one focused on building atmosphere rather than pummeling the viewer, pushing for an emphasis on environmental sounds. In several instances – such as the ringing noise a spoon makes in a teacup – it's very effective in creating a sense of dread or unease. 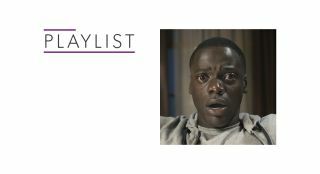 In the final act the soundtrack comes alive like a traditional horror film (it's at this point where Get Out's story becomes more conventional). It's very good in the quiet moments too, pulling the sound out of a scene (such as Missy's hypnosis scene), and in other moments low frequency effects are given a good opportunity to rumble. Michael Abels' score adds to the overall weirdness, incorporating the traditional (strings and percussion) and a curious mix of Blues music mixed with Swahili. Positioned in the surrounds, it often makes for a spooky effect when the whispered vocals come in. Get Out is a refreshing horror/comedy/thriller that takes on a thorny subject and emerges with plenty to recommend it. There's a focus to Get Out, as well as an intelligence to how it goes about its business. The Blu-ray is excellent, playing to the film's strengths with detailed picture and a subtly spooky audio mix. Get Out treats its audience with respect and knows how to get the required shocks and laughs. It's a confident, accessible effort from Peele that entertains from beginning to end.